"There is the traditional practice among Tamang Nepalese daughters of undertaking small economic activities (Pewa) like keeping goats, chicken, etc. This enables the daughter to learn to stand on her feet and makes her self-reliant." Tamangs are mainly found in the districts of Rasuwa, Sindhupalchok, Kavrepalanchok, Makwanpur, Nuwakot, Dhading, Ramechhap, Dolkha and Sindhuli. The census places their population at 4.9% of the national total. The Tamang language, culture and traditions are rich. They were already described as a powerful nation in historic inscriptions going as far back as the 3rd century, attesting to their ancient civilization. They are Buddhists, and their script originates from Tibetan. Their language belongs to the Tibeto-Burman family. The archives of Tamang religious scriptures are rich, varied and vast. Their intellectual hierarchy had categorizations of royal priests, raconteur of history and other scholastic divisions of labor. They celebrate with equal fervor such diverse religious occasions as Lhosar, Maghe Sankranti, Baisakh Purnima and Shravan Purnima. They are fond of buckwheat delicacies. Their dance culture is equally rich and varied. There are many Tamang sub clans. Their population, according to Census 2001, is 1,282,304. 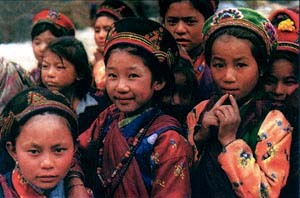 The Tamangs are an ancient and major indigenous people of Nepal. Their traditional area is the hilly region between the Budhigandaki river and the Likhu river. At present, they live in large numbers in the districts of Rasuwa, Nuwakot, Dhading, Makawanpur, Sindhuli, Ramechhap, Dolakha, Lalitpur, Sindhupalchok and Kavrepalanchok in the Central Development Region. They are also scattered all over the country, and outside Nepal they are found in large numbers in Darjeling, Sikkim, Asam and Nagaland of India and in Burma and Bhutan. The total population of Tamang in Nepal, according to the census of 2001, is 1,282,304, ie 5.6 per cent of the total population of the country. The Tamang language occupies fifth place in the country in terms of the number of speakers speaking any one language and first place among the Tibeto-Burman languages. The word Tamang has been found to be used in a document of the thirteenth century. That document found by David Jackson (2976:53) mentions that King Bumlde Mgon built the Shrin fortress in Mustang to suppress the ethnic group Tamang of Lower Glo (Mustang). Although the word Tamang was used as early as the thirteenth century to denote an ethnic group, following the expansion of the Gorkhali kingdom the use of the word was prohibited. The Tamang were addressed in a derogatory manner as ‘Bhote' and ‘Murmi'. The Tamangs have, however, continued to call themselves Tamang. The Tamangs have a system of six types of societal leaders: Tamba, Ganba, Bonbo, Labonbo, Lama and Choho--to keep the Tamang society continuously alive and dynamic. The six have their respective and important roles to play in the development of Tamang society. The Tamba looks after the cultural aspect and has a very important role to play in marriage ceremonies. The Lama carries out death rites (Ghewa) and undertakes activities related to the Buddhist religion. The Bonbo propitiates the local gods and goddesses and assists by providing treatment to the sick and needy in the village. The Labonbo (Laptaba) keeps alive the history of the clan and lineage through the worship of clan deities. As each thar, or subgroup, has its own Phola or clan deity, there are different Labonbos for each and every subgroup. The Choho looks into cases and dispenses justice and maintains peace, security and wellbeing in society. The Ganba participates in all types of social, political and religious activities. He observes the various activities of society, including whether the Tamba, Bonbo, Lama, Labtaba, Choho, etc have fulfilled their functions as prescribed by rituals and to the best of their ability or not, and evaluates the activities and gives his suggestions. Thus, the six societal leaders or actors continue to make the Tamang society aware of its duties and responsibilities. There are also in Tamang society traditional institutions like Nhangkhor active to undertake socio-cultural activities. There are more than 70 subgroups (thar and sahathar) within the Tamang, and inter-marriage does not occur within the same subgroup (thar as well as sahathar). Although inter-marriage can occur between a boy, say belonging to the Yonjan subgroup and a girl belonging to the Moktan subgroup, if the mother of both the boy and girl belong to the same subgroup, however, marriage between them is not possible since they are socially recognized as the son and daughter of the same mother. There is the practice of marrying one's maternal uncle's and aunt's daughter. Unlike in Hindu society, Tamang women do not adopt the last name of their husbands following marriage. Their thar or subgroup does not change, the woman remains in the same subgroup her entire life. When she dies, the body cannot be disposed without the presence and permission of her relatives. There is the traditional practice among Tamang daughters of undertaking small economic activities (Pewa) like keeping goats, chicken, etc. This enables the daughter to learn to stand on her feet and makes her self-reliant. On the occasion of various festival and ceremonies, pujas (worshipping activities) are performed at Gumbas according to Buddhist rituals and injunctions. Along these rituals, Tamangs perform various forms of ancient worships also. They perform Phola venerating the contributions of their ancestors and the history of their earth. Ancestral history is narrated during Phola worship. Similarly the worship of Neda Sipda (deities of land and water) to revere earth as a source of sustenance, worship of Yhulla (Goddess of village) for the prosperity of the villages and the worship of Jyojyomo (most favoured family deity) are also ubiquitous in Tamang societies. Life cycle rituals such as naming ceremony, rice-feeding ceremony, tonsure ceremony, ceremony of giving Nepali Sari (Guniu), marriage ceremony and funeral rite are still prevailing in society. Different ritual experts have different roles in these rituals. A lot of indigenous as well as foreign scholars have conducted research studies on Tamang language and culture.